First, we are using the word "band" to mean a simple ring which has little or no adornment. Like, for example, our traditional high-polish (shiny!) 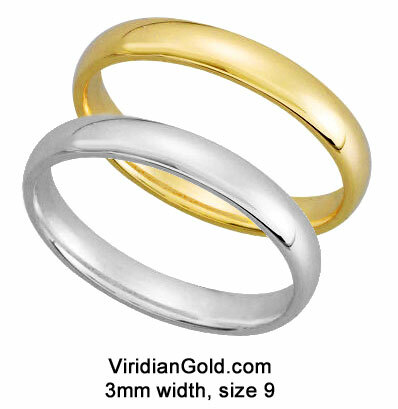 Gold Domed Wedding Bands, which are also available as genuine Domed Platinum Wedding Bands. A simple rule of thumb: When you buy a plain wedding band, you are paying for the weight of the gold or platinum. So how can you compare wedding bands when you don't know the weight? You can't! 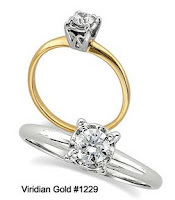 That is why we always tell you the weight of the precious metal in our jewelry--many Internet stores don't even tell you how much gold or platinum is in your ring, so it makes it impossible to tell if you are getting a cheap, thin ring. Even if their price is similar to ours, and the rings look similar, there is no guarantee that the ring is the same weight! And, remember that the weight will increase with the size and width of the ring, so you should expect to see a different weight as those factors change. What about the style of the ring--you have probably heard about domed "half-round" and "comfort-fit"--what does all that mean? You can read more about that in my earlier post called "Wedding Band Basics", but basically the "comfort fit" slides over the knuckle easier because the inside is slightly rounded rather than flat, and this makes the ring a little thicker. 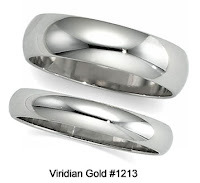 Our 14K Gold Domed Comfort Fit Wedding Bands are available in Yellow or White gold, as well as genuine Platinum. Then, you need to decide on the ring width, which is always specified in millimeters (mm). Most of the time, the groom's ring is wider than the bride's, such as 6mm and 3mm. If you want the rings engraved, it's best to not go any lower in width than 3mm so that the engraver will have room to place a readable inscription! How much is a millimeter? A good comparison is the US Nickel--it is 1.95mm thick. So, three nickles stacked would be pretty close to 6mm. A US Penny is 1.55mm thick, so a stack of two would be about 3mm. This enlarged photo of our #1213 Platinum Wedding Bands shows a 4mm and a 6mm ring, both in finger size 10. You might see some rings described as "tapered". This means that the ring is not the same width all the way around, so it might be 6mm on the upper portion of the ring, and 3 mm on the lower portion, meaning that it will look funny if it rotates on your finger--this photo shows a tapered band, the left of the picture is the "bottom", or narrow portion of the ring. Tapered works best on rings that have stones mounted on their top, that is, they have a defined "top" and "bottom", but a simple band's elegance is in the fact that it is the same all the way around.